A contemporary take on Thai style, this prestigious sunset-facing exclusive estate features six luxuriously appointed beachfront villas. Amenities satellite 42" plasma TV, DVD/CD player, full air-con, fully-equipped kitchen, broadband WiFi internet, outdoor Jacuzzi, shared gym and sauna. Dhevatara Cove is an uncompromisingly luxurious beachfront estate, comprising six vast villas. Traditional Thai architectural framework is fused with contemporary design, to harmoniously set the property within its beautiful natural surroundings. Located on Lipa Noi beach, facing the sunset on the west coast of Koh Samui, the villas at Dhevatara Cove present an elegant and sumptuous lifestyle directly on the beach. All villas at Dhevatara Cove are of immense proportions, and similarly styled, with vaulted ceilings and large glass sliding doors, and natural cool materials, including sandstone and teak wood. The tantalising sea views are immediately apparent from stepping into the central entrance hall, and remain a focal point throughout the property. On the beachfront side of the property, a large wooden deck surrounds 3 sides of the private swimming pool with integrated Jacuzzi, and fountain feature. Adjacent to the pool deck, the vast living pavilion features lofty wood-panelled ceilings, wooden floors, and foldaway glass walls that open onto the pool, beach, and view to maximise indoor-outdoor living. Behind the living room is the large open-plan gourmet kitchen, with island breakfast bar, equipped with state-of-the-art appliances, and your very own chef. Dining al-fresco is a treat at the beachfront sala pavilion, with a wide range of Thai cuisine, fresh seafood BBQs served in idyllic surrounds. Each villa includes 5 or 6 en-suite bedrooms, set on 2 floors, with a total of 4 or 5 double bedrooms, and one twin with 2 single beds. The two master bedrooms feature king-size beds, large bath-tubs, and sea views, while the remaining bedrooms have large walk-in showers, and garden views. In addition to complimentary broadband WiFi internet access throughout the property, plasma screen home theatre system, and sound system with outdoor speakers, the 6 Dhevatara Cove villas share a communal gym and sauna. Located on the West coast of Koh Samui, 10 minutes from the ferry port of Nathon and 35 kms from Samui’s international airport. Santiburi Championship golf course is 25 minutes drive away. 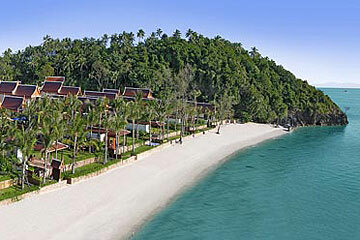 The villas are located within sight of the nearby Raja Ferry pier. -The villa staff will visit twice daily to make sure to keep the villa clean and tidy. -The villa manageress is available to attend to your every need. -Bed linen is changed every third day, while towels are changed as necessary. -Pool towels are provided and replenished as deemed necessary. -Cook service and shopping list available. -Concierge service for all tours and activities; private tours can also be arranged. -In-villa spa treatment with extensive menu.